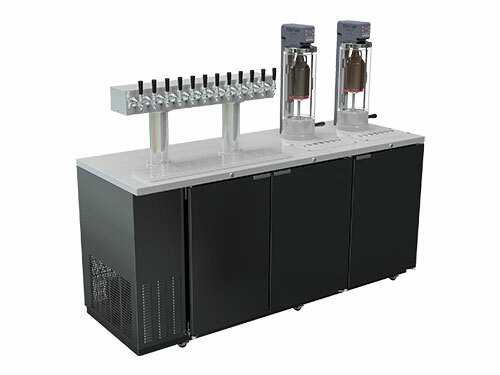 When you work with our Growler Station Specialists, you are working with a team of consultants that will be with you from start to finish ensuring you are up to speed, trained and ready to start selling Growlers on Day 1 with all of the knowledge gained from our other 400+ Retail Partner Locations. Contact us today to consult with a partner that you know you can rely on that won't just sell you equipment and walk away. We work with you to ensure you are set up for success. Choose from one of our pre-designed in-store millwork options. Mix and Match counters, cabinets and walls. Only use what you need or what will fit in your space. Choose your custom cabinet and counter top finishes to match your decor. Short lead times & installation services available. Want something custom, no problem. We have partnered with one of the top millwork teams in the country and can provide custom designs and quoting on request. Different Subscription options to meet your needs, low monthly fees, month to month contracts, free hardware, easy set up, customizable menu templates. A cross platform digital menu system driven by The Growler Stations Powerful & Comprehensive database of Domestic & International Craft Beers Push updates out to your customers through multiple platforms at once. Powered by The Growler Station, Inc. Copyright ©2017 The Growler Station.